BUT OH SO WORTH EVERY PENNY! 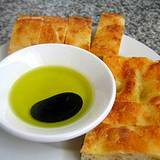 There are two varieties of balsamic vinegar, artesian-made and commercial. True Balsamic Vinegar is more of a liqueur than vinegar and is almost like syrup. This specialty vinegar can only be produced in the provinces of Modena and Reggio in northern Italy. Artisan-made Balsamic Vinegar facts and history can be traced back over 1,000 years. It is made from boiled-down grape and must and legally cannot contain any wine vinegar. The aging process is complex and the juice must be passed down through a series of progressively smaller wooden barrels for at least 6 years, which are kept in a cool, dry location. These special wooden barrels have small holes to their tops, which encourage evaporation, thus allowing the flavors to concentrate. This process also allows special enzymes to assist in the production of complex flavors. 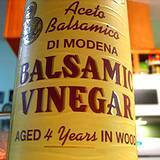 The vinegar must be aged between 12 to 20 years and the cost for a ½ ounce bottle is between $60.00 and $250.00 for certain aged "aceto" balsamic vinegar. Traditional Balsamic Vinegar of Modena, Italy is made from white and sugary Trebbiano grapes grown on the hills around Modena. Custom demands that the grapes are harvested as late as possible to take advantage of the warmth that nature provides there. This traditional vinegar is made from the cooked grape "must" matured by a long and slow natural fermentation, followed by progressive concentration by aging in a series of casks made from different types of wood and without the addition of any other spices or flavorings. The color is dark brown, but full of warm light. The fragrance is distinct, complex, sharp and unmistakably, but pleasantly acid. The flavor is traditional and inimitably sweet and sour in perfect proportion. Production of traditional Balsamic Vinegar is governed by the quasi-governmental Consortium of Producers of the Traditional Balsamic Vinegar of Modena Products produced under their supervision come with a seal from the Consorzio ensuring they have met stringent standards in a blind-tasting by five experts. Balsamic Vinegar History will tell you that among the points of merit aging is the one most important when deciding the quality of this vinegar and great care is taken when certifying. Vingars aged 50 to 80 years is considered good qualtiy. Excellent Balsamic Vinegar is aged 100 to 150 years. The very best is aged 200 or more years! Tasting this grade of Balsamic Vinegar is extremely rare. 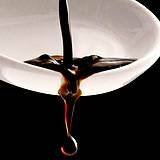 Salad dressings, sauces and gravies benefit from the addition of Balsamic Vinegar. Sprinkle on cooked meats to add flavor and aroma; season salad greens, strawberries, peaches and melons; use as an ingredient in your favorite salad dressing. Rinse and wipe the mushrooms with a damp cloth. Combine the oil, balsamic vinegar, peppercorns, garlic, water, bay leaf and salt in a saucepan. Bring to boil. Reduce heat, cover and simmer for 15 minutes. Add the mushrooms and simmer for another 5 minutes, stirring occasionally. Remove from heat and allow the mushrooms to cool in the marinade. When ready to serve, drain the mushrooms. Heat the oil, add the bacon and sauté until it begins to color. Add the onion and sauté over low heat until softened. Dissolve the tomato paste in 4 tablespoons of water, stir it into the pan then pour in the balsamic vinegar. Add the cabbage and salt, and toss with a wooden spoon. Pour in 1 cup of water and stir. Turn the heat to medium high and cook until the cabbage begins to sweat, tossing frequently. Reduce the heat to low and cook the cabbage for 1½ hours, stirring occasionally. If it seems dry, add a teaspoon or two of water. Serve hot. 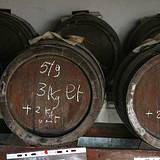 Commercial balsamic vinegar is not regulated and the amount of aging can vary. It may be a blend of artisan-made or even boiled grape-must combined with good quality wine vinegar. 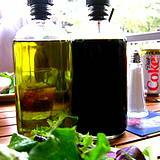 The real inexpensive commercial balsamic is produced from cheap wine vinegar, colored and flavored with caramel. The poor quality can be compared to a quality paint remover and might substitute for one. Nontraditional or commercial Balsamic Vinegar represents the vast majority of Balsamic Vinegar available in the U.S. There is no rule regarding how long the commercial product should be aged, and there is no restriction on the material from which the storage vats are to be made. Therefore, it constitutes a more economical alternative to the traditional product. Commercial products are of high quality and suitable for use in marinades, vinaigrette dressings and in making pan sauces.